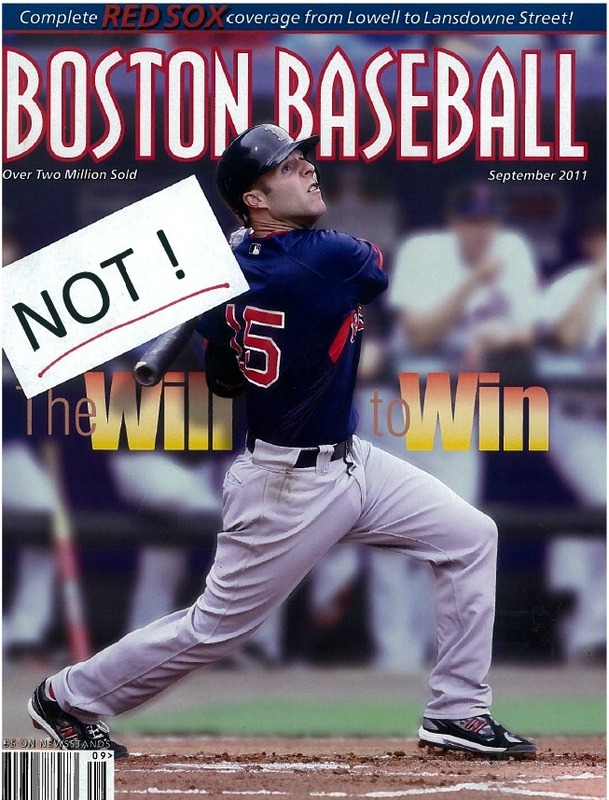 Do the Sox and Pedey have the will to win, as suggested by this week’s cover of Boston Baseball? 18 hours have passed since last night’s collapse and I am starting to regain my balance. I feel like I was hit on the head with a wiffle ball bat, poked in the ribs, rolled over and fanny whacked. 18 hours ago Daniel Bard took a 1 run lead into the 8th inning vs. Baltimore and went Single – K – Single against 3 batters, followed by Papelbon’s K-Single-Double against the next 3 guys. 4 hits in 6 AB’s for 3 runs scored and a blown lead. On a night when Boston could have plumped their wildcard lead from 2 games to 3, the Sox got another poor start and a bullpen fire to boot. Erik Bedard lasted only 2 2/3 IP, yielding 4 runs, 1 ER, 5 Hits, and 2 BB. Bard and Pap’s 3 runs allowed was more than the O’s needed to win, 7 – 5. The Sox had come back from a 4 run deficit and nursed a lead from the 5th to the 8th inning. The team was perfectly set up to have Bard & Pap turn out the lights. That’s what really hurts. The longer this slide goes on, the more creative the Sox seem to be at finding a way to lose. So, do the Sox and Pedey have the will to win ? If distraction is an indication of defeat, then they are already defeated. Reddick dropped a routine liner which led to 4 unearned runs in the 3rd inning last night. That one distracted play could have foretold the outcome. But the Reddick botch wasn’t sufficient. The Bullpen came through and coughed up the victory. If you think you are done, well, you are. And you will find a way to lose. So now the time comes to frame the September Slide in a historical context. Where does a team that lost a 9 game Wild Card lead held on September 1 fit in among Baseball’s greatest collapses ? The 1964 Phillies had a 6.5 game lead with 12 games left in the season. They lost 10 in a row and finished tied for second. That’s tough to top. The 2007 Mets had a 7 game lead with 17 games remaining. They lost 11 of 16, and finished in second by 1 game on the last day of the season when their ace, Tom Glavine, melted down. They’ve been losing ever since. The 1995 Angels led by 11.5 games on Aug. 9, then went 12-27 in their final 39 games ending in a tie with the Mariners. Randy Johnson zotzed them 9 – 1, booting them onto the list of ignominy. My 1978 Red Sox led by 14 in July and still held a 7.5-game lead with 32 games remaining. They lost 14-of-17, then charged back with eight straight wins to force a 1 game playoff with the Yankees. And then, Bucky Dent. The 1951 Dodgers had a 13.5 game lead on Aug. 11. They went a respectable 26-22 after that date, but the Giants won 37 out of their final 44 games, tying the Dodgers on the final day. The Giants won a 3 game playoff punctuated by the Shot Heard Round The World. The 2011 Boston Red Sox were thought able enough to win 105 games by many with their loaded pitching staff, hardy hitters, and newly acquired studs. They rebounded from a dreadful 2 W – 10 L start, captured first place and had a seemingly insurmountable 9 game lead in the Wild Card on Sept. 1. Their starting pitching fell into a funk, the bullpen burst into flames, and the fielding errors were many as the Sox lost 13 of 17 in September. With the Wildcard lead down to 2 with 7 games left, their starting pitchers recorded an ERA of 8.97 as the Sox lost all 7 games by a combined score of 56 to 21. Tampa took the Wild Card by 3 games. And if it does happen, I’d put the 2011 Sox right there with the others mentioned above. Maybe not the worst of the worst. But definitely adrift somewhere between the others, feeling around in the dark for another win, unsure of how really bad they themselves are. I should not watch the game tonight. But I cannot look away. This entry was posted on September 21, 2011 at 9:23 pm	and is filed under BASEBALL, Dustin Pedroia, RED SOX. You can follow any responses to this entry through the RSS 2.0 feed. You can leave a response, or trackback from your own site. I don’t know. I feel like something harder than a whiffle bat hit us tonight. True dat, TooSoxy, True dat.